Or was it a packed theater because many there had dreams of rising above their class status by competing in “Bank Night.” “Bank Night” contributed to the ability of the film industry to survive during the Great Depression. This was an ingenious idea by Charles Yaeger in which a number was drawn and the person had to get to the stage in a set amount of time to win. To have Bank Night, theaters paid a fee based on the size of your theater which would entitle them to a registration book, equipment to pick numbers and a film reel with a Bank Night trailer. As long as your name was entered in the registration book you could win. You didn’t have to purchase a ticket for the lottery or the show which allowed the theaters to circumvent lottery laws. Many people did choose to buy tickets which helped the post war theater industry greatly at the time. And on that ice-cold night as many as 1,200 people (according to the New York Times on December 20, 1942) stayed, probably not wanting to bundle up all over again and face the brisk air. After “Bank Night” and the 108-minute screening of “Kitty Foyle,” the two ushers cleaned up and then maybe sat in the ushers booth before heading out. The owner, Irving I. Green, was home sick with the “grip.” Did the ushers smoke in the backroom before heading out? That was the first question Malden Deputy Chief P F Keddie asked of the two ushers the next morning before telling them they would be out of a job. Only an hour after the ushers left, the Maplewood Theatre caught fire and burned to the ground. “Maplewood Theatre Gutted by Fire” was the headline of the Malden Evening News (December 19, 1942). “All was lost.” According to the newspaper, an unattended cigarette was suspected as the cause of the fire. Luckily, that night Fred Anderson was on his way home from his job at General Electric when he saw the flames. So did Louis Lanouette as he waited for his bus in Maplewood Square. Mr. Lanouette activated a fire alarm box by turning a knob or pulling a hook and Mr. Anderson ran straight to the fire department itself. After the fire alarm was activated it caused a springloaded wheel to turn and tap out a pulsed electric signal corresponding to that box’s number. This immediately signaled the fire department that there was a fire on Lebanon Street in Maplewood Square. The Malden, Everett, Melrose and Revere fire departments all rushed to the scene. They were likely aware that just a month earlier, a terrible fire had swept through the Cocoanut Grove nightclub in the heart of Boston. The Nov. 28 inferno killed 492 people including four Malden residents (Edna Cameron, 17 Washington Street; Elizabeth Kirwan, 51 Fairmount Street; Katherine Swett, 50 Salem Street; and Alice McLaughlin, 42 Mt. Vernon Street). One Malden resident survived, Margaret Emerson, 21 Clifton Street. Cocoanut Grove was the reason they were also advised to notify the FBI. 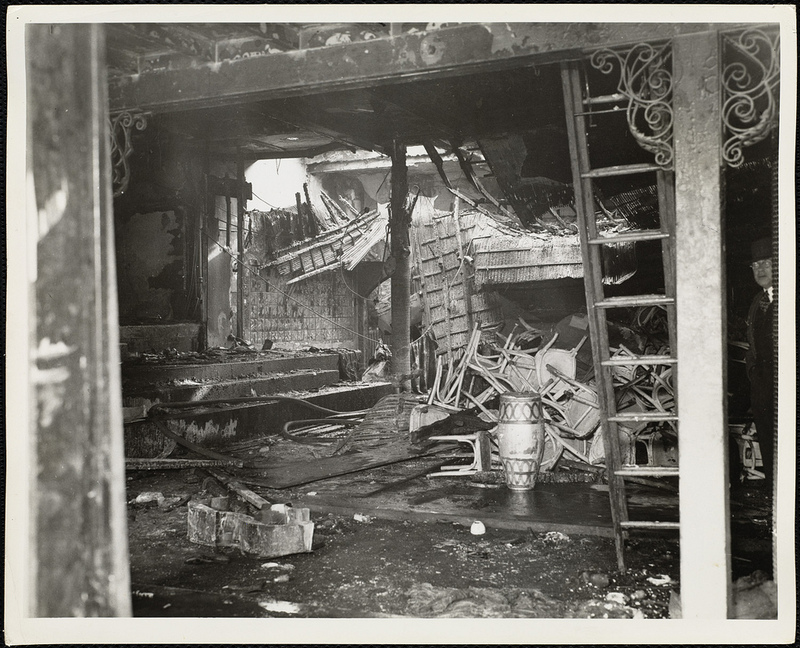 Aftermath of the fire at the Cocoanut Grove Lounge, 1942. Courtesy of Boston Public Library. The freezing cold weather on that early morning caused no end of problems. The hoses were quickly turned on but some were frozen and inoperable. In addition, as the water hit the pavement it became icy and treacherous for the fire fighters. One fire fighter fell and was injured. He was quickly brought to the hospital and was later released with minor injuries. According to the Boston Daily Globe, “the blaze could be seen for miles” and attracted a large crowd of onlookers. “Huge tongue of flame licked the brick-sided theatre.” The building collapsed about 1:30 a.m., the Globe reported. The surrounding businesses were mostly unscathed thanks to the quick response of Anderson and Lanouette. The theater, however, was completely destroyed. 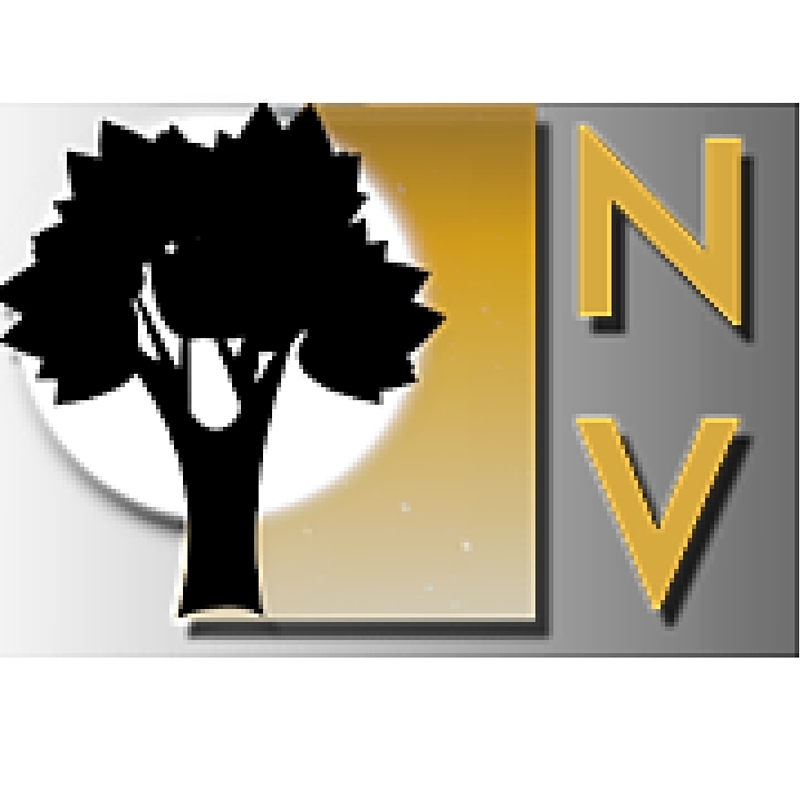 The losses were estimated at $30,000. In today’s terms with inflation that would be an estimated $428,577. 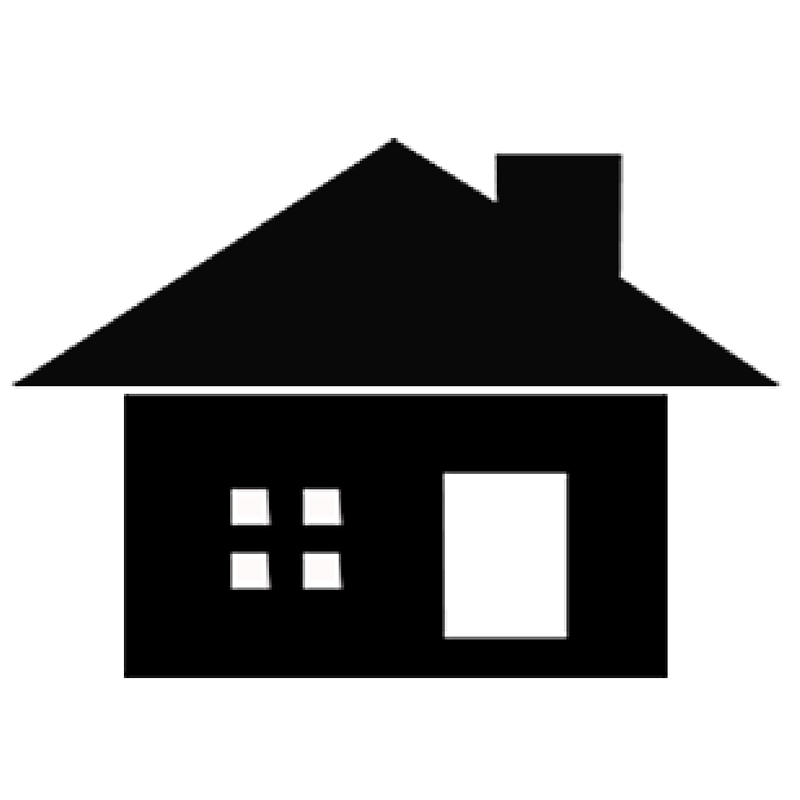 Although the price tag was massive, the owners quickly got to work rebuilding. In May, 1943, the Malden Evening News boasted “Rebuilt Theatre Opens Tomorrow.” The grand opening showing was “Gentlemen Jim” with Errol Flynn. Flynn plays a banker named James Corbett who later turns boxer. The board of directors for Corbett’s bank includes a judge who hopes to improve the image of boxing by recruiting competitors like Corbett who are considered to be from respectable backgrounds. 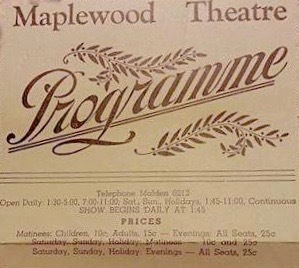 The final hours of the original Maplewood Theatre were the showing of the film “Kitty Foyle,” a film about a woman who wants to marry the man she loves but it would lower his social status. The new Maplewood Theatre began by showing “Gentlemen Jim,” a film about a man being asked to behave below his social status to further a sport. The Great Depression had left its mark. 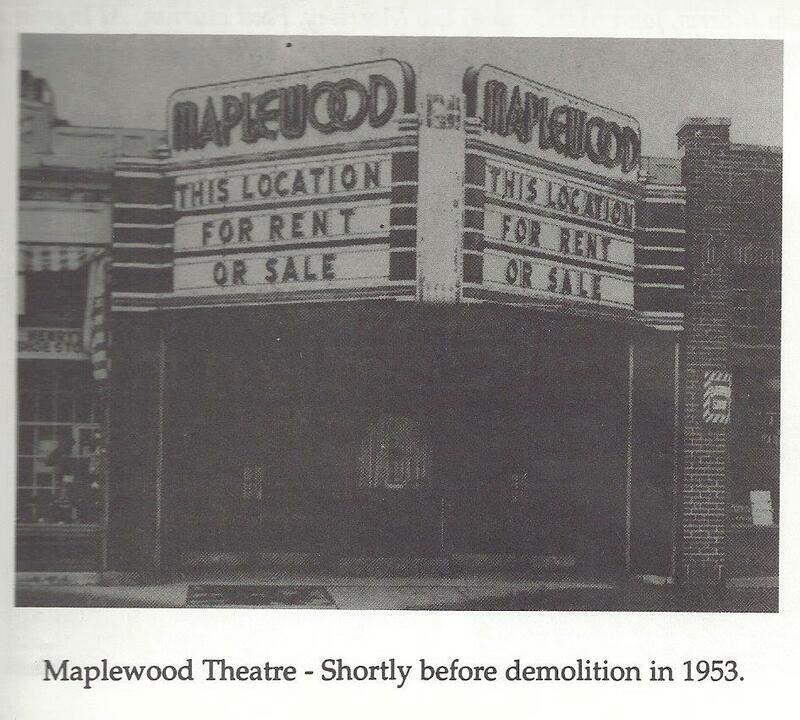 Bankers also figured in the final chapter of the Maplewood Theatre because 10 years later the theater was bought by Malden Savings Bank for a branch bank, according to the Malden Evening News of April 2, 1953.